It's the 27th tomorrow - arrival of the plasterer! Phew! One last job to do today and that's a second visit to the tip with the old carpet. So.....27th Plasterer...later this week the radiator and bedstead are off to be sandblasted and painted...3rd November - decorator....17th November wardrobe arrives. One thing I have tried not to do is clutter the other rooms in the house with stuff I've cleared - so once the plasterer has left I will make sure the other rooms are back to normal....then I can start on Jon's study. Tomorrow I will arrange the date with the plasterer and go from there. Whilst looking on-line I noticed Next have some bargains in the clearance section - so I snapped up some curtains for £25. I have just ordered another pair - same price and have plans.....watch this space. This is my O and P contributions for ABC Wednesday - which I missed last week as we've been so busy - celebrating 20 years of Jon's business - 2 business network functions, helping a friend get sorted with some hens and sorting out the room! 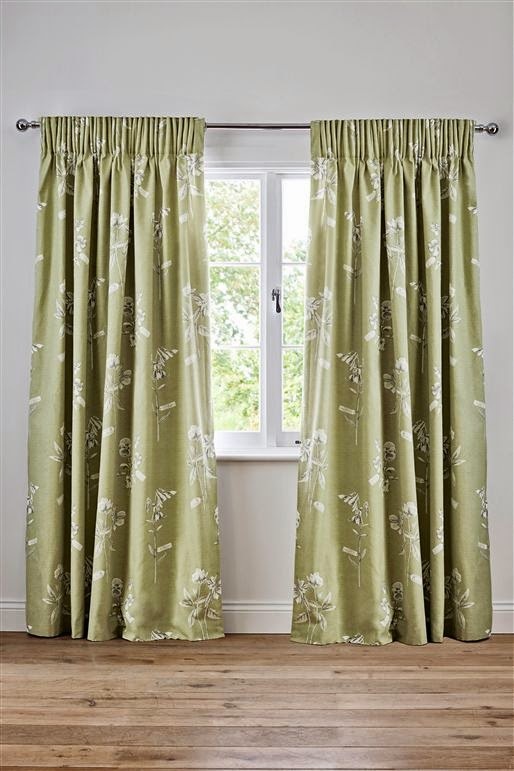 Whilst my theme has been the garden I haven't had time to be honest - but the curtains are a botanical theme so that's good enough for me! 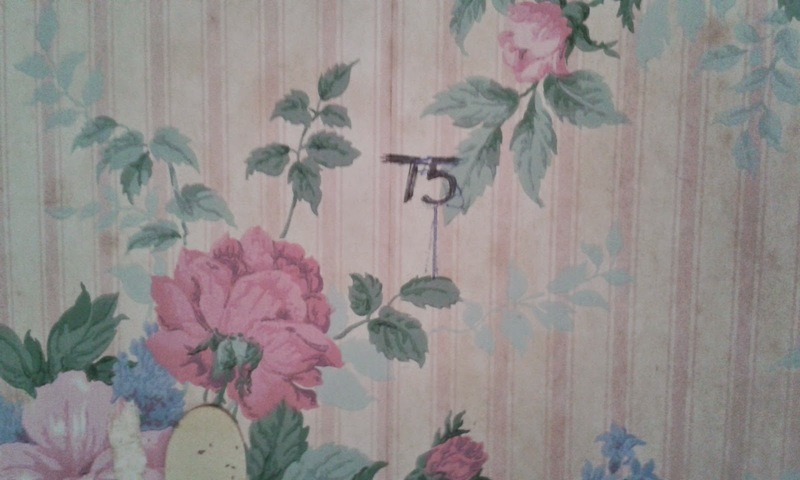 This was the first room we decorated when we moved here in 1991. 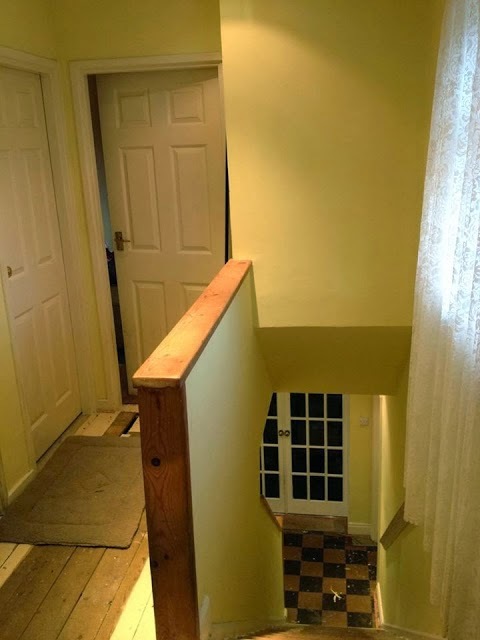 We had a dado rail fitted but to be honest we didn't get the height correct. Our house was built in 1956, an ex-Police house. The 50's doors were replaced with your average colonial doors still popular today. 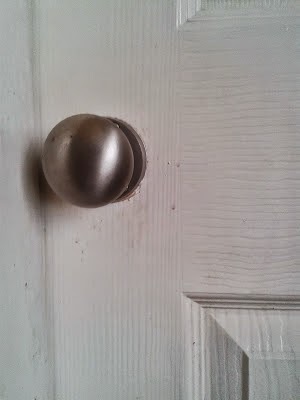 Last year all the doors were revamped by re-positioning the handles and door furniture. They were also painted white. the door to the left of the photo is the second bedroom. Door to the right is 3rd bedroom, Jon uses this as his office/study.....next to be tackled. 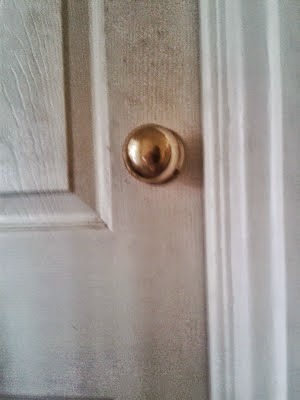 I must admit I look at any doors now as I feel with such a design the handles have to be in this position. Strictly speaking the dado rail should be around the same height as the handle and ours are too high. 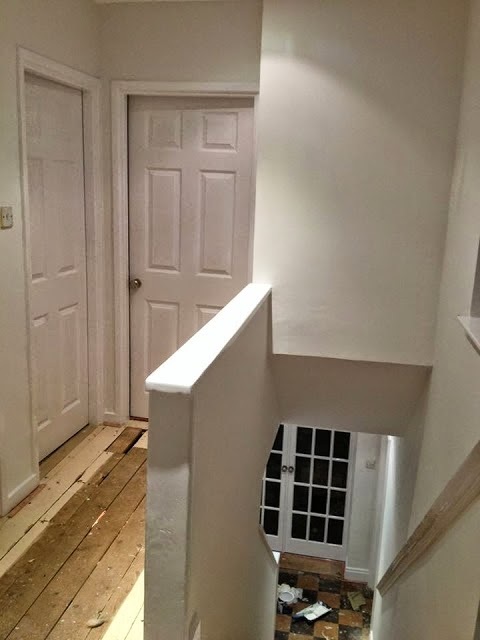 If they had been in the correct position we may have considered keeping it, but the room needs re-plastering so we are removing it and going for the same style we have through the rooms we have revamped. 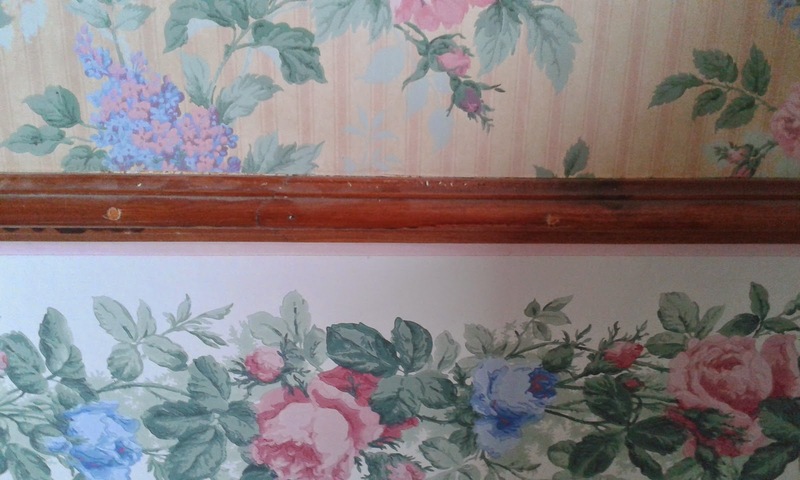 The wallpaper has certainly aged - stains have started coming through from the original wallpaper paste but 20 odd years is good going. 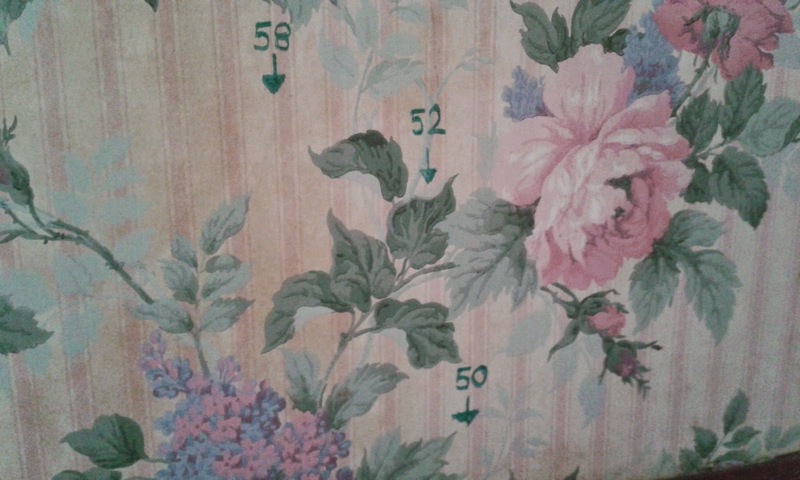 Yesterday I was looking at wardrobes and measuring up - hence the various scribbles on the wallpaper so I could envisage where the wardrobe would fit. In the end I went with this one from Argos. The dimensions are Height 2060mm Width 1490mm and Depth 580mm. 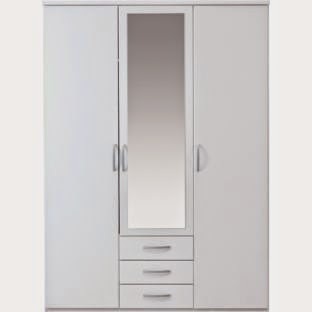 Reduced too to £183.99 - Delivered Tuesday November 18th. 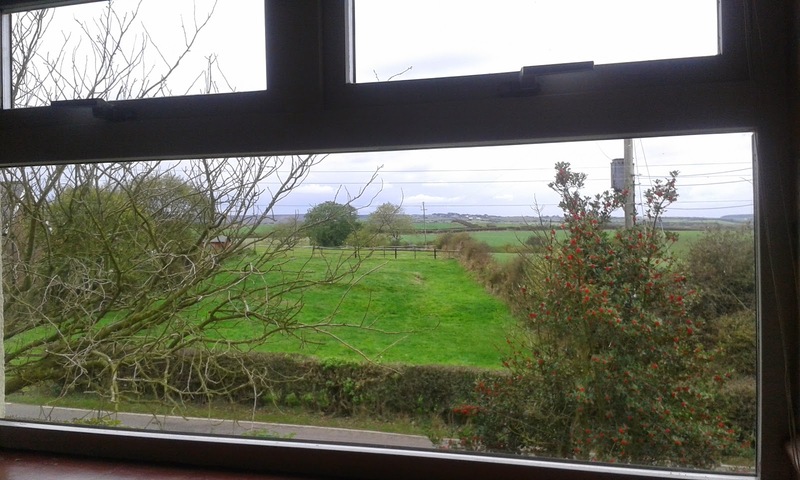 I want the room to be clutter-free because after all the view is what it's all about! I have more or less sorted the second bedroom. The filing cabinet is being collected on Friday and a set of shelves is awaiting collection. The pile of L.P's and a box of single records is in Jon's study awaiting his sorting - I feel they are destined for the loft. I have a box of stationery miscellaneous items to sort - which I can do at a later date - it's not urgent. I have 2 small shelf units which is the maximum space I have allowed for my craft and sewing paraphernalia. I will start stripping the wallpaper tomorrow. Jon is working some of the weekend so I aim to have the room stripped as soon as possible. 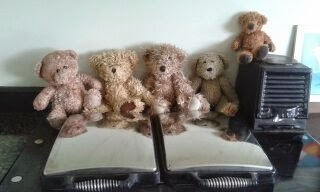 I am keeping my teddies - after a wash today they are currently drying off! I have been making the most of the good weather and have nearly finished planting up the front verge. I have lost count of the exact number of bulbs I have actually planted as I clear out old grass and squeeze a few bulbs in at each opportunity. Often a session sees me plant anything up to 50 at a time. I have done the sessions in a slightly erratic fashion - initially starting by the gate nearest to the house, then the end nearest to my neighbour as Emma was in the garden and we were chatting, then I tackled the middle of the space as I had a different selection of tulips and so my reasoning continues in a hap hazard fashion such I put down to the Mrs Nesbitt approach! I am planting a selection of bulbs, mainly Narcissus, tulips, grape hyacinth and blue bells. It is very addictive and due to the wonderful tool called the internet I can source sound suppliers, indeed as I write I have 250 bluebells on route. I also have about 230 tulips, 130 mixed narcissus to keep them company! I spent most of Saturday planting, Sunday was a lovely day so we had a tootle over to Scarborough on the motorbike. Whilst I wore my leathers I was well wrapped up with my fleece tights courtesy of Asda. To think that only last weekend when I was planting away I was wearing my shorts! The sudden change in temperature saw me scrambling for suitable clothing at the drop of a hat - but I think I am sorted now. Warm jumpers seem to be on the cards now. When the days are wet (like today) I continue with the clearing of the second bedroom ready for the plasterer coming on 27th. I plan to clear the room by Friday 24th leaving me Saturday and Sunday to strip the wallpaper. When I read that last sentence I try not to feel a hint of panic if I stick to my guns I should be on plan as I know next week is busy but I'll carry on. I have decided on the colour anyway - sticking to the Farrow & Ball colour scheme I am going for Tunsgate Green as I want to keep the room light. The view is lovely from that room so I don't want to take the focus away from the window. Whilst I was de-cluttering the second bedroom (27th fast approaching) I came across several rolls of undeveloped 35mm films. We had no idea what was in store but here are a few of the garden back in 1995. Sunday was one of the nicest days we have had in a while. 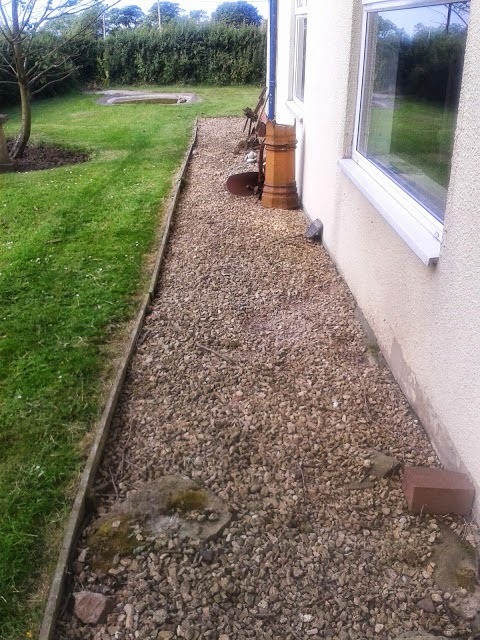 I was tempted to go out with Jon on the motorbike as those opportunities have to be taken - but in the end I decided to spent the afternoon working on the front verge. What a lovely time I had - neighbours were stopping and chatting, people were stopping in their cars to comment and all in all I really felt people would be watching in the Spring for the bulbs to emerge. I am getting rather obsessive with the bulb situation. daffodils are so cheap at the moment - and in such great quantities - I bought a couple of sacks of yellow species, 2 sacks of mixed varieties, some tulips and more tulips are to come. I plan mixing them all up together - oh and a few packets of wild flower seeds too! My M contribution for ABC Wednesday. Labels: ABC Wednesday, Day to day life in the Nesbitt household, Garden, Home, Jo my faithful gander. The owner of our local electrical shop has an allotment, so from time to time she brings eggs to sell. 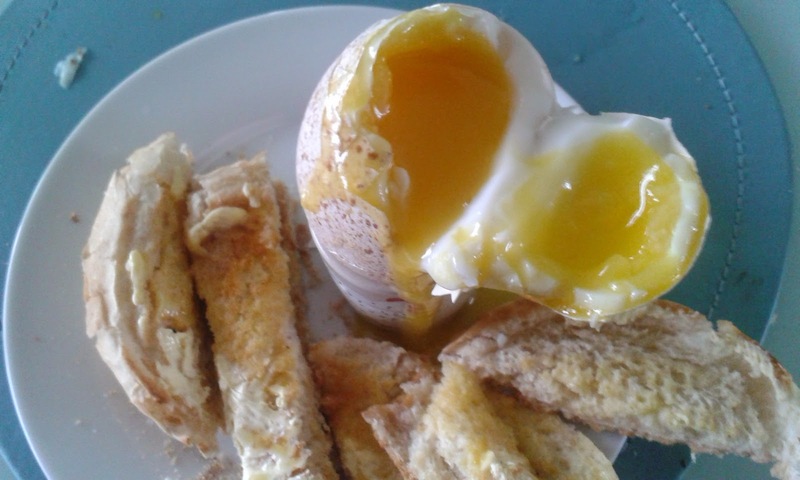 On Saturday there was a bowl of turkey eggs, £1 for 3. Needless to say I had to try one. Boiled for 6 minutes as suggested by the lady - absolutely gorgeous. Very light and nowhere near as heavy as a duck egg. Will be buying some more - very reasonable.